Mix corn starch and soy sauce until well blended. Stir in broth and 2 Tbsp. dressing. Heat remaining dressing in large skillet on medium-high heat. Add shrimp, ginger and garlic; stir-fry 3 min. or until shrimp turn pink. Add bok choy; stir-fry 2 min. Add peas and onions; stir-fry 2 to 3 min. or until crisp-tender. Stir in soy sauce mixture; bring to boil, stirring constantly. Simmer on medium heat 1 to 2 min. or until thickened, stirring frequently. Add tomatoes; cook and stir 1 min. or until heated through. Serve over rice. Substitute baby spinach leaves for the bok choy. Top with sliced green onions and toasted sesame seed just before serving. 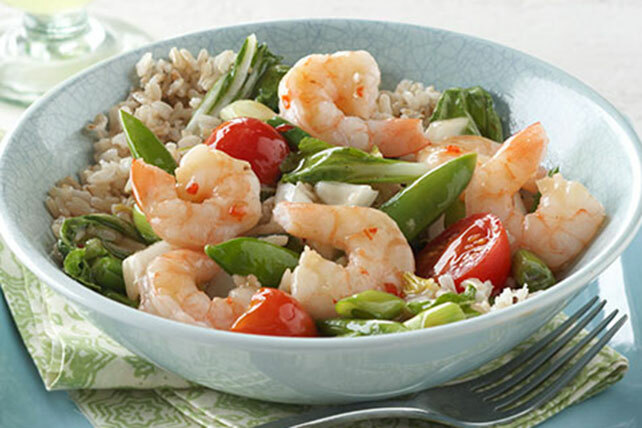 Help your friends and family eat right with this delicious stir-fry. As a bonus, the bok choy provides an excellent source of both vitamins A and C.